Recently I wrote a post, the hottest trend on the airplane since the mile high club, about something disturbing, yet quite intriguing, that was taking place not just on the airplane, but behind the locked lavatory door at 35,000 feet. 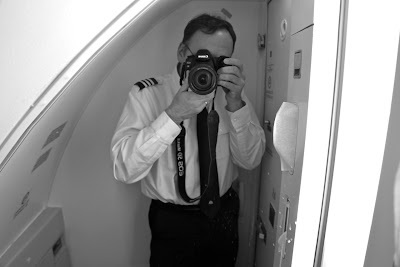 Passengers, and I’m talking all kinds of passengers, have been photographing themselves in the bathroom. Alone. Doing what, I don’t know. But they look like they’re just standing there. And I wanted to do it, too. I had written, “Oh you better believe I’ll be taking my own self portrait in the lav on my next flight to New York on Wednesday. Until then, check out these interesting shots.” And then I added a photo gallery I’d put together of passengers I’d found on Flickr.com standing in the lav, camera in hand. Sounds to me like someone needs to lighten up, and they can start by grabbing their camera and joining the club – the laviators club. I did! Nope, that’s not me up there in the photo, that’s first officer Kent Wien, who also joined the club. I guess we both just had to do it. Even though my seat mate did look at me a little funny after he caught me trying to sneak my camera into the front pocket of my pants. The first thing I did when I got home was download the photo onto my blog. I had a good laugh and I honestly thought that would be that, end of story. But a few days later I got an email with a photo attached from a Gadling reader. “This one’s for you,” Nate wrote, and that’s all he wrote, and it cracked me up!